Promoting a peaceful and lasting resolution to land conflicts in a protracted crisis context through a fair and environmentally sensitive approach. Since the late 19th century, the vast natural resources of the Democratic Republic of the Congo have constantly provoked violent interventions from outside the country and fueled internal conflicts. Population pressure, competition for land resources, mining, forestry and hunting, lack of secure access to land, weak governance and the instability of the institutional framework have caused tension between different actors. Thus, competition over access to natural resources is a structural problem and one of the main factors fueling power struggles in the region. In the current context of constant insecurity, arable land is under-used and productivity is limited. Conflicts contribute to a shortage of livelihoods for the most vulnerable rural communities, environmental degradation, and underpin a propensity to use violence to resolve problems. Land disputes represent a serious threat to the development and stability of the country, particularly in the east, where frequent movements of people fleeing conflicts increase tensions between groups, particularly host communities. 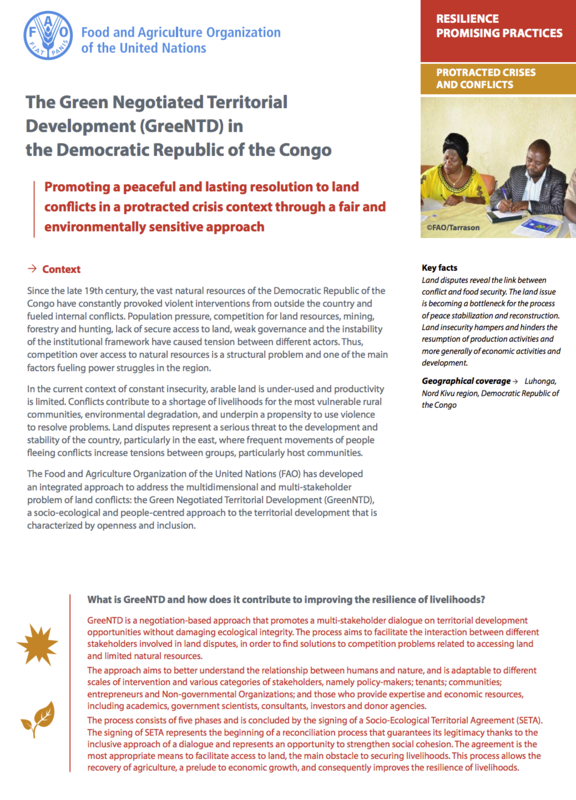 The Food and Agriculture Organization of the United Nations (FAO) has developed an integrated approach to address the multidimensional and multi-stakeholder problem of land conflicts: the Green Negotiated Territorial Development (GreenNTD), a socio-ecological and people-centred approach to the territorial development that is characterized by openness and inclusion.